Have you been searching for that great late night mmj snack that just does the body good all over!! The type of snack that just makes you feel tingly inside but at the same time eases your mind. 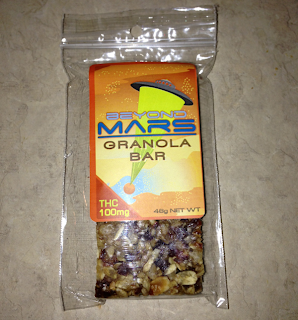 Look no further, try the Beyond Mars - Granola Bar. This delicious marijuana edible contains 100 mg of THC and contains the following ingredients: oats, honey, almonds, peanuts, seeds, sun dried cranberries & apricots, peanut butter, brown sugar,activated hash oil, vanilla and butter. 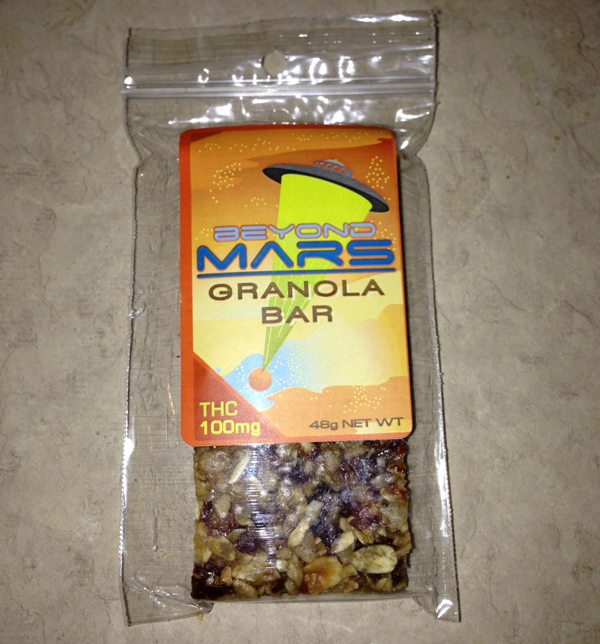 The granola bar is loaded with dried fruit, filled with nuts and drizzled with a brown sugar glaze. The edible is of perfect strength if you are looking for a mild high. I highly recommend this if you are looking for a Decently priced $7 to $8 edible with good flavor, and gets the job done at any time of the day! Morning, Noon or night !